Kaplan and Norton, the originators of the Balanced Scorecard, described it as a performance measuring tool the enables managers and decision makers to look at a company’s overall performance or the performance of individual departments or functions from the perspective of the organization’s internal and external customers as well as shareholders. The balanced scorecard measures performance from four perspectives the customer, internal processes, innovation, learning and the financial perspectives. The indicators and metrics used to measure each perspective are based on the company’s business strategy and goals. Using the Balanced Scorecard to train the company’s employees ensures that the company’s strategy id followed through and its vision remains intact. Metrics used in the Innovation and Learning perspective of the company not only focus on imparting training but measure employee satisfaction, operating efficiency and continuous improvement on both micro as well as macro level. 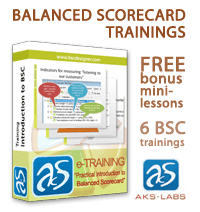 By using a Balanced Scorecard for employee training an organization can monitor and improve the employees trained ratio (employees trained divided by total number of employees), employee training cost (total training cost divided by number of employees trained), training cost per hour (total training cost divided by total training hours) and employee turnover (a function of employee satisfaction). Beyond these metrics, the biggest benefit of using a Balanced Scorecard in training is that it enhances the effectiveness of training. One of the proven benefits of training is a tangible improvement in the company’s bottom line (such as increased sales, improved services, product quality, etc). An excellent example of how training based on the Balanced Scorecard is more effective is the way Best Buy, the consumer electronics retailer from Richfield, Minnesota, went through with its expansion phase. Best Buy used Grand Opening University (GOU) to train managers and supervisors for the new stores it planned on opening. This was to ensure that service quality remains consistent throughout the stores and customer satisfaction is not lost at any point. The training process thus conducted put supervisors in training at existing stores for two weeks, learning leadership skills and how to open and operate a new store. Also, five weeks prior to the opening a sales manager for each new store attends a five-day course at Best Buy’s corporate campus. The managers here get to learn strategies for successfully training new supervisors and employees. They are also given a whole day to get hands-on knowledge about the products that will be sold at their store. Best Buy’s yardstick for measuring the effectiveness of this training is the Balanced Scorecard which uses metrics for employee satisfaction and turnover. Best Buy has effectively improved employee satisfaction through training and reduces turnover from a 110-120% range to a 70-80% range. As for the bottom line, Best Buy estimates that every 0.01 improvement in employee satisfaction surveys equals a $100,000 addition in profits, and Best Buy scored a 0.03 improvement with its GOU training.